We run our business in accordance with high financial standards, set by our regulating authorities. This protects interests of our existing and potential clients and contributes to our success. The company’s services have gained recognition of over 150 000 clients all over the world for business conduct transparency and commitment to business integrity. EXISTRADE owns and manages the powerful brand WORLD FOREX that offers internet-trading and Digital contracts trading services. WORLD FOREX is the trademark of EXISTRADE LTD. Company. 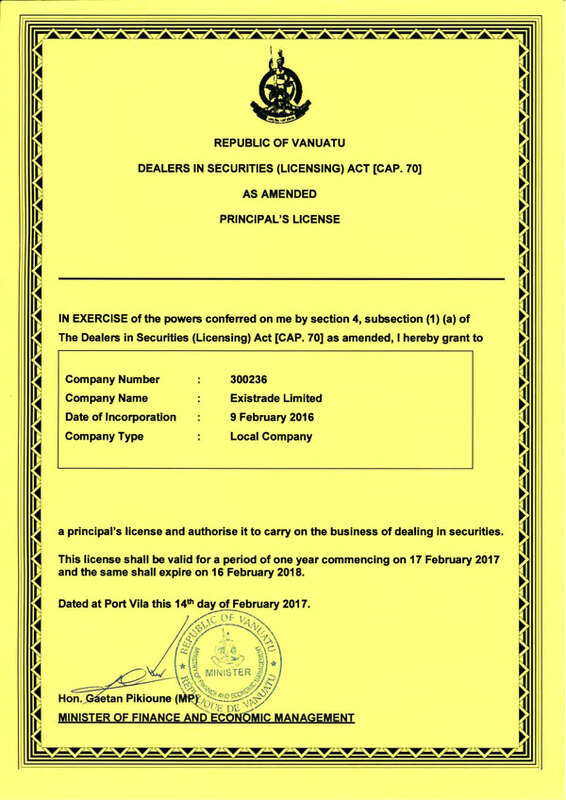 EXISTRADE LTD. is a holder of the license issued by Vanuatu Financial Services Commission (number 300236). One of the EXISTRADE Company primary concerns is our clients’ fund security and protection. Clients’ funds are effectively protected in one of the biggest bank of Europe — Erste Corporate Banking. EXISTRADE utilizes an automated fund control system and enhanced methods of effective risk management. High level of protection is achieved by means of a confidential data transfer channel via Secure Socket Layer technologies (SSL).